Cassia is the latest release from Illusion Designs (04-12-2006). She is a remake of an earlier character with the same name. Everything about the new Cassia V3 is new, beginning with an incredible texture mat, all the way down to the fine tuning of the facial expression and the body shape and Aiko 3 options. New eye colors, a completely new set of 10 make up mats and an incredible new set of 5 second skin mats complements this package. Cassia for Victoria 3 is a must have on anyone's Runtime folder. 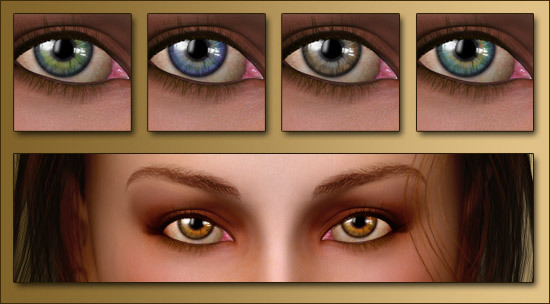 Default head texture, default eye color and default face morphs shown. Image has slight post work. Hair am jewelry are not included. amount of rendering options. They all work for both Victoria 3 and Aiko 3. Images shown have no post work. Not all options shown. Aiko 3 option show. Default head and body morphs, default make up and body textures. Images have no post work except composition. Not all options shown.
? You need to have Victoria 3 base (item # ps_pe036) plus Complete set of head and body morphs installed (item # ps_mr130) from Daz 3D in order for this package to work. 8 (sets) sets of second skin lingerie mats, accompany this package. Images shown have no post work except composition. Not all options shown. Hair is not included. Second Skin for Aiko 3 options shown. 3 pose files for body tonal will give you superior skin color and variety control. Gorgeous models for both V3 and A3.These characters just kee ..